Canada Soccer and the Canadian Soccer Players’ Association which represents members of Canada Soccer’s Women’s National Team have reached a two-year compensation agreement through 2020. The agreement covers payments made to Canada Soccer Women’s National Team Players, performance and roster bonuses for competitions including the upcoming FIFA Women’s World Cup France 2019™ and general terms relating to image rights use, player appearances, travel and accommodation. 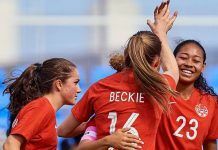 The Canadian Soccer Players’ Association is made up of members of Canada Soccer’s Women’s National Team who are ranked fifth in the FIFA World Rankings. The association was formed in 2016 to formalise negotiations and to continue to foster an ongoing and positive dialogue with Canada Soccer, the governing body of soccer in Canada. The agreement reflects a positive and fair partnership between the two bodies and represents the organizations’ mutual commitment to growing the opportunities for Women’s National Team players. Canada Soccer’s Women’s National Team are in its final preparations for the upcoming FIFA Women’s World Cup France 2019™. Canada will face long-time foes England on 5 April in Manchester City, before returning home to play a special “Send-Off” match against Mexico in Toronto at BMO Field on 18 May at 13:00 ET/10:00 PT.